MOSCOW (Sputnik) - The United States wants to prevent the inhabitants of Syria's Rukban camp and the international community from seeing how peace is gradually returning to Syria with the help of the government, the heads of the joint Russia-Syria coordination center on refugee repatriation said on Monday. MOSCOW (Sputnik) - The Jordanian authorities refuse to allow Rukban camp refugees from the neighboring Syria to enter the territory of Jordan, the joint statement of the Russian and Syrian interdepartmental coordination staffs said Thursday, urging Amman to reconsider its position on the problem and let the refugees into the country. MOSCOW (Sputnik) - The United States has refused to let bus convoys, set to evacuate refugees from the Rukban camp, enter the US-controlled zone in Syria's At-Tanf, where the camp is located, Russian Defense Ministry Center for Syrian Reconciliation head, Lt. Gen. Sergei Solomatin, said Saturday. MOSCOW (Sputnik) - Russia and Syria have sent bus convoys to the Rukban refugee camp to evacuate people seeking to leave the US-controlled territory, with no response received from the United States to guarantee the safety of the operation, head of the Russian Center for Syrian Reconciliation Lt. Gen. Sergei Solomatin said on Friday. 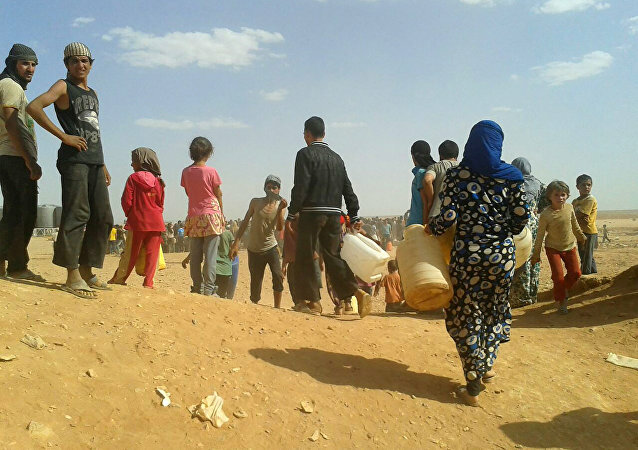 WASHINGTON (Sputnik) - Russia is calling on all parties to allow for the immediate evacuation of anyone who wants to leave the Syrian refugee camp of Rukban, Russian Ambassador to the United Nations Vassily Nebenzia told the Security Council on Tuesday. MOSCOW (Sputnik) – Militants are still preventing refugees and their families from leaving Syria's Rukban camp, head of the Russian Defense Ministry's Center for Syrian Reconciliation Lt. Gen. Sergei Solomatin said on Monday.